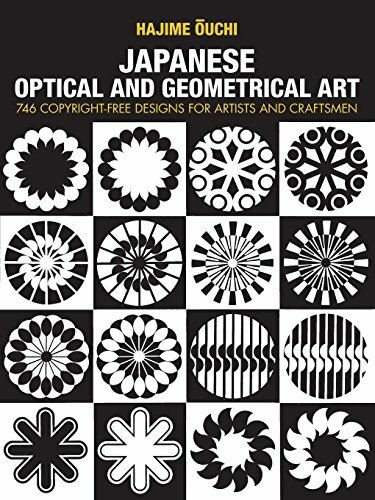 Japanese Optical and Geometrical Art Some of the most ingenious and attractive modern motifs. 746 designs. Some of the most ingenious and attractive modern motifs. 746 designs. The 746 designs contained in this volume represent some of the most ingenious and attractive applications of geometrical and optical motifs to be found today. Taken from an authentic, modern Japanese work, they are an intriguing new source of unique design elements for artists, designers, and illustrators. The designs employ circles, dots, squares, ellipses, curves, lines, angles, complete alphabets, and numbers in a seeming infinitude of balance, asymmetry, repetition, harmony, swirl, and mathematical exactitude. Some seem to recede, advance, shimmer, and dazzle in the manner of Op Art; others fool the eye with wholly unexpected shifts in focus; still others start with a basic theme and either develop remarkable variations or repeat the same element almost endlessly. But all, from the smallest design to those that take a full page, fascinate and delight. This book is an inexhaustible source of novel, appealing, and striking design elements for advertising campaigns, packaging, display, industrial use, crafts, textiles, and similar fields. These designs may be used as they are, or cropped, enlarged, reduced, repeated, rearranged, combined, screened, superimposed, cut apart, overlaid, or otherwise employed. All illustrators, designers, crafters, and commercial and graphic artists will find this collection immensely usable and the individual designs extremely effective.